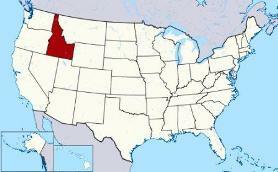 Where is the Capital of Idaho? 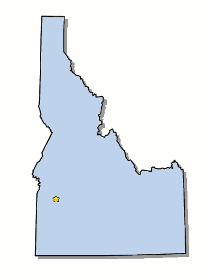 The Map of Idaho (ID) shows the location of the state capital in the "Gem of the Mountains". Idaho has 44 counties, and the capital of the State is Boise. On a map, the capital city is always indicated by a star. Interesting fun facts about Boise including its history, location, county, current population, size of the city and the nickname of Boise, Idaho. The Map of Idaho and map provides an outline of the state, which covers 83,574 square miles. The size of the state's capital city, Boise, is 80.05 square miles. Test your recognition skills of the map of the state, and knowledge of its capital, with our State Maps Quiz Game. The location of Boise is in south western Idaho, about 41 miles east of the Oregon border, and 110 miles north of the Nevada border. The city is located in Ada county, Idaho. Each of the 50 states have their own capital city. The city of Boise is the capital of the state. The capital does not have to be the largest city in the state, but is usually centrally located either geographically or by population. Fact 3: The population of the capital city - 212,303. Nickname "City of Trees"
Fact 4: It is the county seat of Ada county, Idaho. Fact 5: History - In 1834 Fort Boise, owned by the Hudson Bay Company, was established by British fur traders. Fact 6: History - In 1862 gold was discovered in the Boise Basin and started a gold rush, attracting numerous pioneers. Fact 9: History - The Arrowrock Dam was constructed and was the tallest in the world from 1915 to 1932. The number of people, or the population of the capital city of Boise, Idaho obviously changes constantly but the government statistics for the 2012 population of Boise was 212,303, which provides a good indication of the number of inhabitants of the city. We hope that the interesting facts and information about Boise will help kids and school children with their homework. Learn more by playing the States and Capitals Game. Boise Nickname "City of Trees"